Review: Imaginative, smart, and creative are all words that describe Kevin's Point of View. Del Shannon does an amazing job putting together so many details to create a story that is full of adventure. Some of the craziest things happen to the main character Kevin Tobin. This twelve-year-old boy has a lot of imagination letting different characters "run" his mind. This adventure book takes through time and catches the reader by surprise every time. The story begins with Pudge running through the streets of New York City with a package that Pudge needs to mail to Devin in Colorado. The package's delivery is messed up; a boy named Kevin Tobin ends up getting the package. Not sure, what the package is Kevin toys around and gets into trouble. When Devin finds out who received the package he does not intend to get it. He will do anything even kill. Devin finds Kevin and his best friend Tony and tries to get the package. Devin chases them through streets, mountains, canyons, minds, and on trains. Nothing stops Devin from getting what he wants. Traveling through time does not even stop him. As he chases Kevin and Tony through the streets of Boulder, Colorado yet again, Devin is still unsuccessful. A thriller that changes Kevin's life comes with a surprise at every turn. Can the unthinkable really happen? I absolutely loved this book. I never wanted to go to sleep because I could not leave Kevin and Tony hanging. I did not want to leave the world that was being painted in my head as I read it. Not only being suspenseful but often times funny Kevin's Point of View makes you want to keep reading and not stop for anything. The setting develops throughout the story with the mountains and canyons becoming visible in your mind. Del Shannon takes you into the mind of Devin and into the mind of Kevin. The book shows what they both are thinking and what is going on around them. The way Kevin puts himself in a different situations really adds uniqueness to the novel. It makes it interesting to read and lets the reader come with Kevin on a different journey. Only someone with a creative mind could come up with something so great. I hope Del Shannon writes a sequel to the story. I will be the first one in line at the bookstore the day it comes out. A five star book that really deserves six stars but the scale does not go that high. Kevin's Point of View is an amazing story written by an amazing author! We would like to thank Del Shannon for providing a copy of Kevin's Point of View for this review. Have you read Kevin's Point of View? How would you rate it? 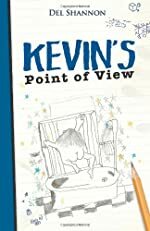 I've read Kevin's Point of View and wrote a review of it, but I think Kathryn did a much better job than I did! But I agree, I can't wait for the sequel and the author is amazing!